Why not enjoy the late days of summer with a new gazebo in your yard? Although summer is nearing its end, it’s not too late to add a beautiful outdoor feature to your landscape! Why not enjoy the late days of summer with a new gazebo in your yard? For families and individuals who love to spend time outdoors, a gazebo is a perfect accessory to complement the look of your yard, garden, or deck. With so many styles to choose from, you are sure to find one that perfectly complements your existing landscape design. As you shop for your new landscape accessory, consider these three beautiful gazebo styles to enhance the look of your outdoor space. A pavilion gazebo design is an octagonal shape. It is commonly recognized as the traditional style for a gazebo. The open sides of this design allow you to enjoy a late summer breeze from every side of the structure. Casual and practical, this gazebo design is a perfect fit for a family who loves to entertain throughout the summer or spend time outside throughout the week. While pavilion gazebos are typically octagonal, they are also available in rectangular and oval shapes to complete the look of your yard. A Victorian gazebo design is similar to the detailed look of a traditional Victorian style house. These designs typically include ornate detailing along their beams, braces, and panels. Although their style matches that of a Victorian style home, they can also add flair as a fun accessory in your landscape. This style of a Victorian gazebo may be perfect for enhancing the look of your garden or adding a more formal look to your landscape design. A rotunda is a circular gazebo design with a dome roof. 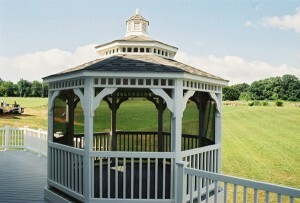 Similar to the style of a Victorian gazebo, rotunda gazebos are often more elaborate in form and ornate in their design. These structures serve as beautiful accent features in almost any yard. Because of their size and versatility, these gazebos are most commonly found in parks as a place to enjoy the shade, with plenty of seating space in a beautiful circular design. Ready to Update Your Outdoor Space?